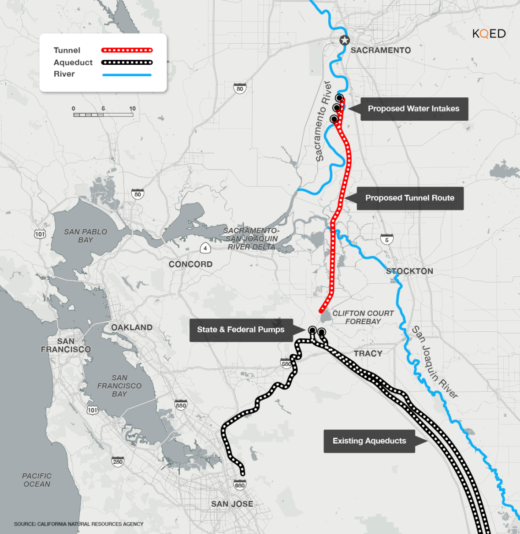 Twin tunnels that would carry water from the Sacramento Delta south are one step closer to happening. The Metropolitan Water District of Southern California has voted to cover nearly 11 billion dollars of the project’s construction cost, over the objection of the region’s two largest cities, Los Angeles and San Diego. Under a weighted voting system, board members representing more than 60 percent of Metropolitan’s territory approved picking up what would have been agriculture’s financial share of the project. Tuesday’s vote added $6.5 billion to the roughly $4.3 billion that Metropolitan voted to allocate to the California WaterFix, which would build three water intakes in the Delta to send water through two tunnels to Southern California. Metropolitan, whose 26 member agencies supply water to 19 million people, has invested heavily in the WaterFix already, including by buying four Delta islands in the tunnels’ proposed path. But the project has been on shaky ground since another potential funder withdrew. The Westlands Water District, which would have funded 25% of the project, voted to drop out last September. At the time, Metropolitan’s general manager, Jeffrey Kightlinger said that without Westlands, “you don’t have a project.” last September. A month later, the Santa Clara Valley Water District offered only "conditional support" for WaterFix, with a preference for a scaled-down, one-tunnel project. Last week Metropolitan’s staff recommended a staged approach to the tunnels project, beginning with one and adding another if circumstances warranted it. Then a last-minute letter from Governor Jerry Brown pushed the board to choose the two-tunnel option. After the vote, Brown claimed victory. “This is a historic decision that is good for California — our people, our farms and our natural environment,” he said, in a written statement. Metropolitan’s board room was packed and, at times, rowdy. Environmentalists and opponents to higher water bills turned out to make public comment, including Bruce Reznick, the executive director of LA Waterkeeper, who referenced his appearances at prior hearings. Voicing support for the two-tunnel WaterFix option were chambers of commerce, trade groups, business interests, and Orange County cities, including Anaheim. Today’s vote means that the wholesaler and its customers will be on the hook for at least two-thirds of the project’s cost. That’s just one reason board members representing San Fernando, Santa Monica, San Diego and Los Angeles voted no. “The ratepayers are obviously going to incur a dramatically increased risk,” said Mark Gold, one of five board members from Los Angeles, where Mayor Eric Garcetti has vowed to double local water supplies by 2035. In recent years, both LA and San Diego have begun to invest in alternatives to importing water, including stormwater capture, groundwater storage, water treatment, and cutting demand. Gold says he fears the pricey twin tunnels project will undermine that work. Several obstacles remain. The WaterFix has environmental approvals from state and federal authorities, but it still requires more funding, and a green light from the State Water Resources Control Board, to go forward. The project is also the subject of a number of lawsuits. Metropolitan’s leadership says it’s prepared for the fight it deems necessary to stave off catastrophe. "Do we want to wait for Katrina and then say let's go deal with it?” said Metropolitan chairman Record. “We have examples out there that say the time is now." This story has been updated to clarify Santa Clara Valley Water District's 2017 vote on WaterFix.